An important part of my doctoral work, was about fire ventilation. The thesis was on tactics, but I used some experimental work on fire ventilation (and on fire suppression) to identify and to show a number of fundamental tactical principles. The work on fire ventilatino even became a text book. It has even been translated into English. And fire ventilation still follows me and I still do classes and travel all over the world talking about fire ventilation. Fire ventilation is very simple, at least in theory. Its simplicity comes from the fact the fire gases moves from higher pressure to lower pressure. The larger the pressure differential, the faster the fire gases will move or the more fire gases will flow. Actually, this is all you need to know about fire ventilation. The hard part is to determine how various pressure differences “looks like” and to apply methods that assists fire fighting. 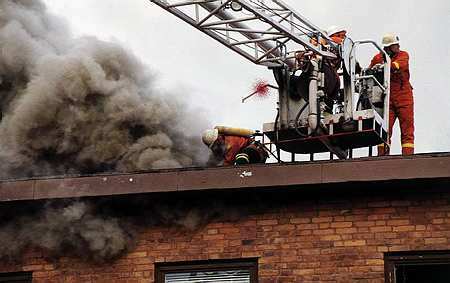 And when it comes to actually do fire ventilation on a fire scene, then we get into a lot of problems. A simple “tool ” for determining (and especially understand) how various pressure differences interacts, especially inside a building, is the Bernoulli equation. The Bernoulli equation describes the relation between pressure and flow. Imagine a tube with a flowing gas, where the ends of the tube are on different levels above some reference level. The Bernoulli equation tells us that the sum of atmosperic pressure, hydrostatic pressure and hydrodynamic pressure at point one and two, respectively, are constant. By the help of this simple relation, the ratio between size of inlets / outles as well as the flow rate out through an opening can be determined. For the fire and rescue services, fire ventilation is about creating openings, thus creating a flow of smoke and hot gases as well as for fresh air. The trick is to do this efficently, to consider pressure differential and to make these pressure differentials work for you.